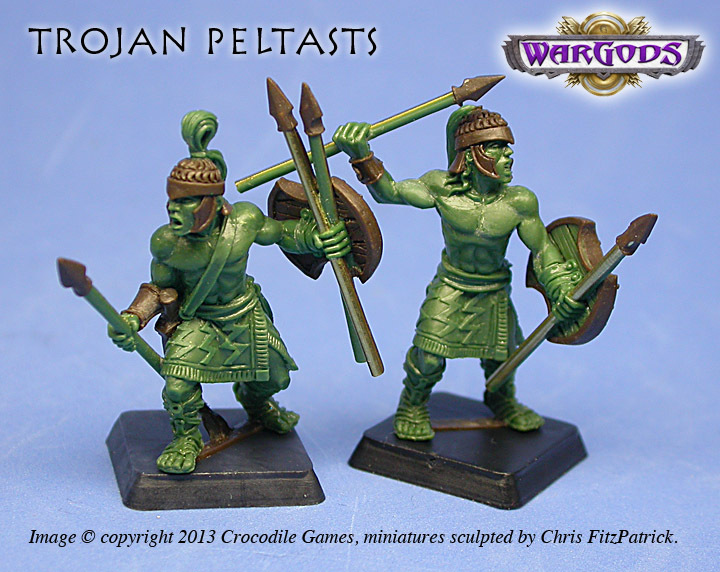 Crocodile Games - Message: Let's discuss the Trojans! Posted By Topic » Let's discuss the Trojans! 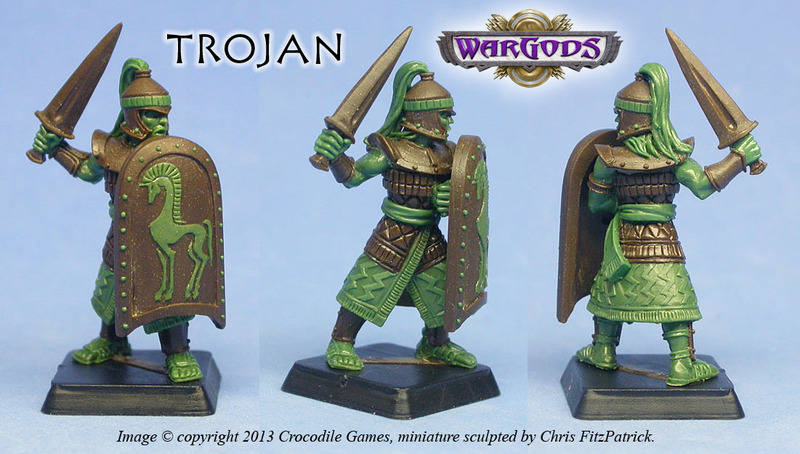 OK, so we've been posting pictures of the Trojans over the last few days, getting ready for the upcoming Kickstarter. I thought we might make a spot to talk about the new minis, what you guys like and want to see, warband ideas, and so on. When Des and I started working on the Trojan designs, we want to make sure that they had something of an eastern feel, but still had some Homeric-greek elements. They are greeks, they share the same gods as the rest of Hellas, but because of their location they have more exotic influences. There is a myth that the last of the Trojans escaped the Trojan War, and his descendants went on to found Rome, so we even worked a very slight Roman element into some of the Trojan designs. A fun fact: these are not my first attempt at sculpting Trojans! My first Trojan sculptures were waaayyy back when I was about 10 years old, and I made a 'Trojan Horse' diorama for school. The Trojan Horse was made out of balsa wood, and there were walls and little stick-figure Trojans cut out of modeling clay. Alas, I believe that no photographs survive of my first attempt! So what do you guys think? Anyone want to see anything in particular? Speak now, or never! They look solid. Are we gonna get spears too? 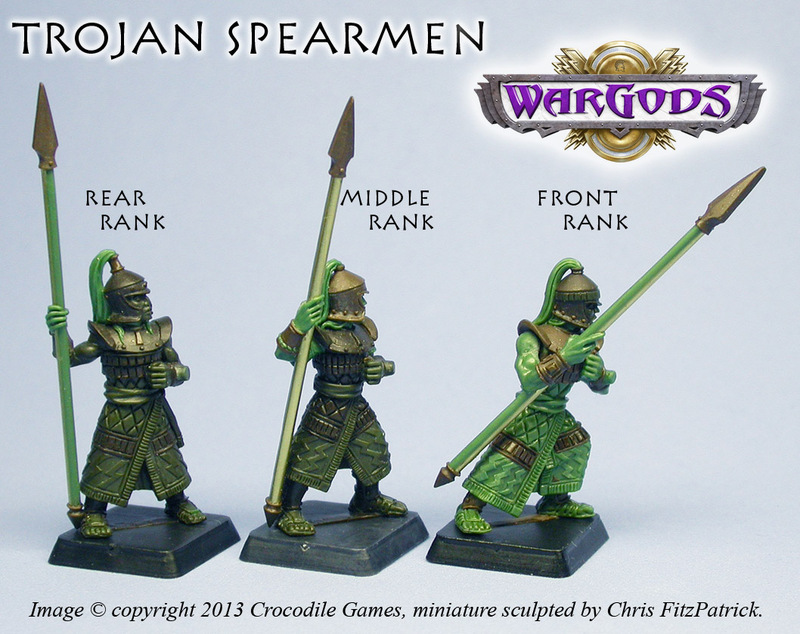 So with there being Trojan and Mycenaean swordsmen minis floating around are we going to have rules for swordsmen in this upcoming Olympus rulebook? I am assuming yes but confirmation would be nice. One thing, and this is REALLY minor, can you see if you can get your hands on slotta bases that have a horizontal rather than a diagonal slot. With the horizontal, the figures are actually facing the front of the base instead of looking sideways. Otherwise, love the spearmen, swords, the peltasts are especially cool, and I would imagine we will see archers and perhaps a chariot soon as well? Yes. They were not an option on the original draft of the rules, but I'm going to add them due to overwhelming popular demand! Our base manufacturer does not currently make straight-slot bases, but I'll keep bugging him, maybe someday he'll come around! I've designed most of these new Trojans specifically for the diagonal base. Right now, we've only shown one pose, but with the other poses assembled as a complete unit, hopefully you'll see that the guys are all advancing forward, most looking forward but with the odd guy looking to the left or right. Trojan archers are nearly complete. They'll get a chariot in the second wave -- I hope we'll be able to fund the second wave of Trojans if the Kickstarter is really successful. Love it! They look great! I'd like to see how you did the figure-8 shields. Any Dendra armor planned? Any chance of Lukka/ Sea People types w/ the feather helmets? Needless to say, I'm excited! Wait! Why no mention of the Amazons since the initial Kickstarter anouncement? Where will they fit in? The Amazons are not a part of the initial options for the Kickstarter. They will be unlocked as one of the first stretch goals, if we can make it to the basic funding target. The reason for this is that we want to keep the funding goal realistic and achievable, and adding an entire extra faction to start with would raise our costs by thousands of dollars. I'm really hoping our fans will pledge early to help us get there, you can always change your pledge while the program is still underway to add Amazons, etc, once they are unlocked. I've already sculpted a number of the Amazon models, we'll start showing these off once the program is underway and we to the basic funding goal. 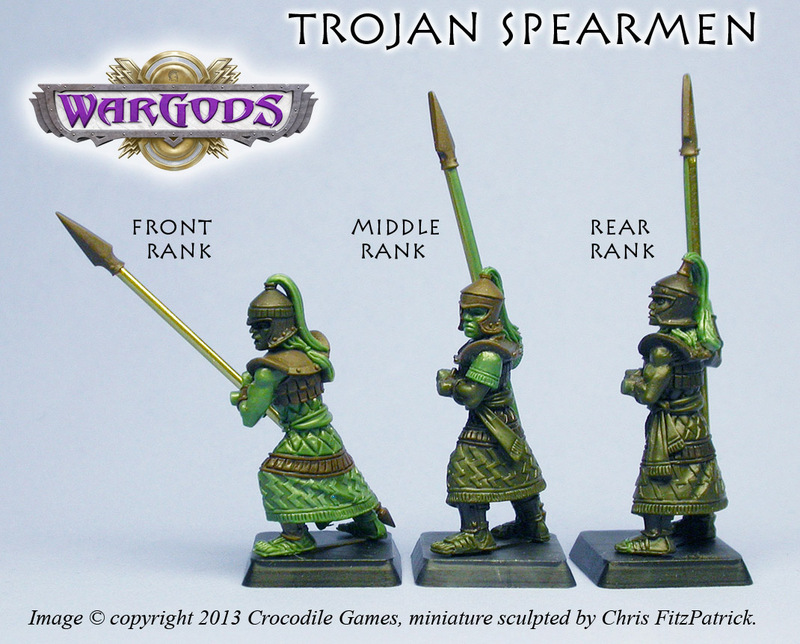 The Trojan Archers are already done, the minis look just like the color illustration the desktop.